Fredericksburg Texas, November 6,7, and 8—be there! Some of us will meet at Terry Sayther Automotive on Friday afternoon and drive out together, meeting a few others at our hotel, the Peach Tree Inn. Then we will have dinner together and return to the Peach Tree courtyard to tell stories. Saturday morning we will be joined by yet more vintage BMW people and have some breakfast at the Airport Cafe, then head out for a country road drive. Following lunch we will return to Fred and have some relaxing time for socializing, shopping or whatever makes you happy. Dinner together Saturday night will be followed by more lie telling…err, story telling. Sunday morning breakfast is the last scheduled time together until next spring! 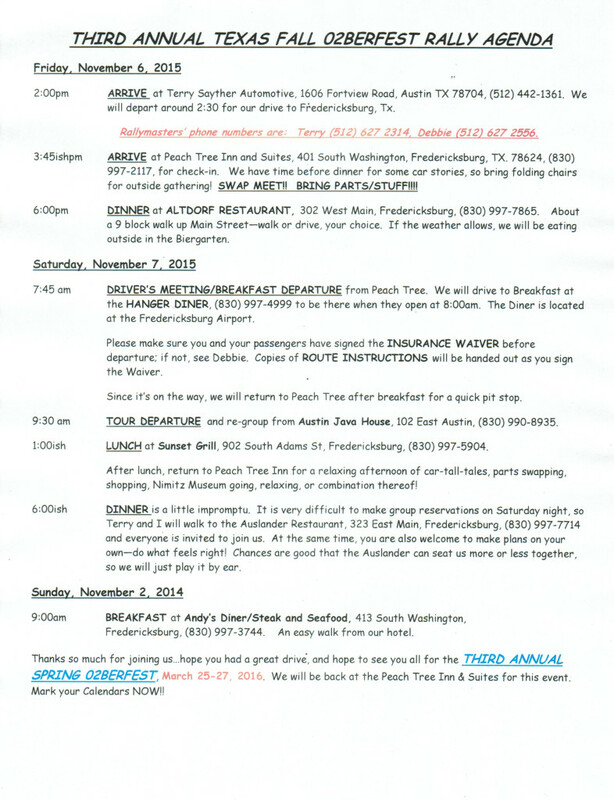 Hope to see you all either here in Austin or in Fredericksburg soon! Register for free website membership to be ready for future events. Read about the 2013 Texas 02berfest here. See photos from the 2014 Texas 02berfest here.